Visit local artists and learn Nepalese art, craft, architecture and culture. Get the deeper insight of Tantric, Buddhist and Vedic cultural life, visit local artisans and smiths to watch them crafting metal and wooden handicrafts. Most of the writers after being familiar with Nepalese society gave common views as in the dictum “Every other building in the valley is temple and every other day is festival.” What appeared to them as festival is the native people’s day to day activities and artistically bedecked medieval edifices embedded with various pantheons. Infact ethnic groups were stratified into various occupational groups, which lead to specialization in the task particular group or caste was following. However Nepal being closed until 1950, the art was never industrialized and was very less influenced by modern techniques. This special package intends to guide you through these ancient way of life, medicinal practices (Ayurveda), art and architecture (Vastushastra) and more..
Day 02: Day to observe Tibetan Buddhism in Nepal, Tibetan Refugees and skilled occupation they have been pursuing. The art of Thanka painting, carpet weaving and sculpting various Buddhist curios mark the particular area of Kathmandu as a “Little Tibet”. 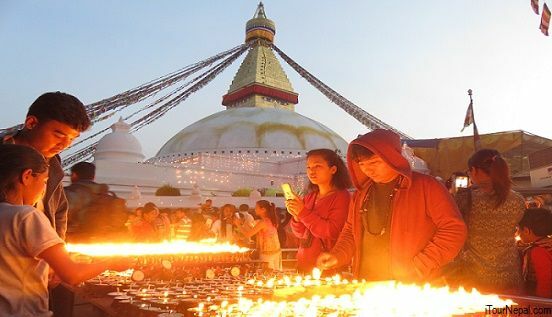 The area renowned as Boudha has more than 45 monasteries with in its small premises. We will also visit one of the monasteries to observe monastic life. Day 03: Today’s tour will be focused on religious tolerance or amalgamation of Hinduism and Buddhism in the Valley. 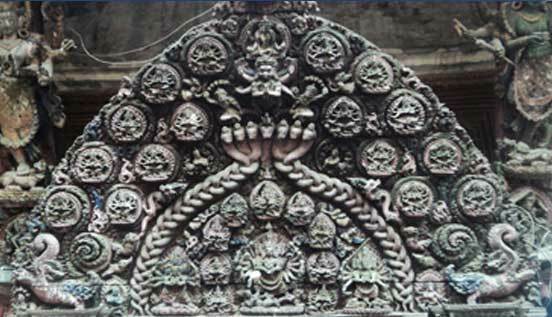 The two streams developed in prehistoric time had Kathmandu as a confluence in the medieval age, which is specially depicted in the struts, tympanums and entrances flanked by guardian deities. Our expert will segregate each and every figure’s root in Hinduism and Buddhism, the legend behind it and their integrations. Day 04: On the day we will shed light on ancient architecture of Stupas, temples and city planning. The ancient of architecture was so well developed that they were resistant to natural catastrophes. Pulsing through the streets of kathmandu you can’t imagine once these cities were were planned based on the ancient knowledge of 'Vastushastra' (the material science). Vastushastra is a knowledge of human's well being, which can only be achived when we are in harmony with nature and universal flow of energy. statues, stupas, entrance gates and pagodas. Lalitpur meaning ‘the city of fine art’ still induces visitors about the suitability of its name as the significant numbers of people still pursue the age old occupation. We will also observe the traditional art of lost wax process of metal sculpting. Day 06: Bhaktapur-the city of devotees is also known as living museum for the town remained firm to modernization and populace still practice the age old traditions with same enthusiasm. Populace was stratified into occupational groups for the efficiency in art and craft skills. Some of which are still observed such as potter’s spinning out clay utensils, hand made paper productions and wood carving. Day 07: The day is full of excitement with short walk in the southern Kathmandu. 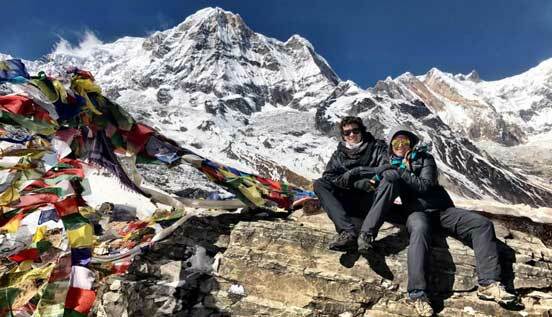 The hike is fascinating with the looming view of snow clad peaks in north and the carnival like appearing Newar village towns. At the end of the hike we will arrive at the medieval town of Bungmati, which is specialized in wood carving. Day 08: Fly to Pokhara. Drive to Butterfly monastery and on the way back go to Old Market Town eventually coming to David’s Fall. At evening you can walk along the lakeside and choose good restaurant for Dinner. Pokhara is the best place to contemplate mountain life and it’s environs. Peoples were more concerned in agriculture, which is just subsistent. Their skills has been smoldered in adjusting with the topography. However you could observe churning of nature for living and its supremacy for which mountains are considered sacred. 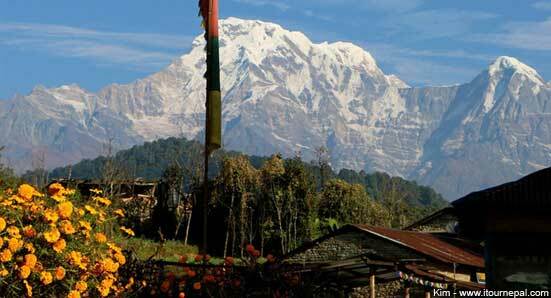 Day 09: Drive to Sarangkot for the morning view of Annapurna. Walk back to Hotel. You can even walk up to the new Stupa on the hillock across the lake. At about afternoon fly back to Kathmandu. Day 10: You will be free on the last day for last hour shopping and preparing for the departure. Combine this tour with 3 nights 4 days Lhasa Tour starting and ending in Kathmandu, Nepal. 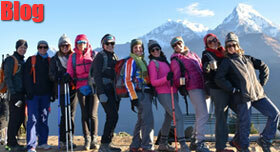 Kathmandu being surrounded by foothills of Himalaya provide beautiful hike and short trek.